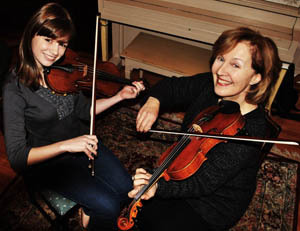 Traditional Irish dance and fiddle music will fill the Merrimack Repertory Theatre on June 4 in a program sponsored by Lowell National Historical Park. Fiddle player Laurel Martin and step dancers Kieran Jordan and Kevin Doyle are all recipients of 2010 MCC Traditional Arts Apprenticeship grants. These publically-funded grants allowed these artists to provide a year of one-on-one teaching to talented apprentices Natayla Kay Trudeau, Emerald Rae, and Nicole Leblanc. This free concert presents a unique opportunity for collaboration, as teachers and students come together to present the results of their apprenticeships and insight into their teaching methods. Come join us for an exciting evening of solo, duet, and group performances revealing the history and shared languages which these artists express, preserve, and pass on. Event presented by Lowell National Historical Park and funded in part by the National Endowment for the Arts, the Massachusetts Cultural Council, and the Southern New England Traditional Arts Apprenticeship Program.